At this year's Annual General Meeting for Nature Saskatchewan, a summary of the organization's revenue sources was presented to the members present. A request was made at that time to make the accompanying charts available to the general membership for their information. Following is a view of this information for the end of October 2016 (the Nature Saskatchewan fiscal year ends on March 31). The figures provided are estimates of the situation at that point in time, meant to show a general description of funding sources and relative amounts. The summary of NS revenue sources consists of three charts. 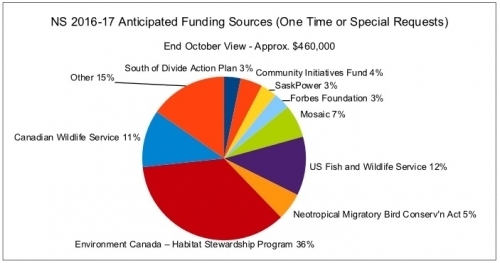 The first one is a summary report of 'Anticipated Funds' from one-time or special sources for the year – an approximate view of funds that have come, or are expected to come, from various specific and/or one-time large donations or requests. The second chart shows realized or anticipated revenue from recurring multi-year sources. The third chart shows an approximate view of revenue categories including the overall amounts from these first two charts, plus amounts for memberships, general donations and publications. The 'Other' category in the chart above includes numerous specific revenue items of less than $15,000. If you have any questions about this information please contact Jordan Ignatiuk (Nature Saskatchewan Executive Director) at (306) 780-9293 or 1-800-667-4668, or by email at jignatiuk@naturesask.ca, or Ed Rodger (Nature Saskatchewan Treasurer) at (306) 757-7059 or by email at edrodger@sasktel.net . If you prefer you can also print this Summary of Nature Saskatchewan Revenue Sources in PDF format.